This week I've been reading "The Happiness Project" by Gretchen Rubin - one woman's tale of deciding that although she was happy in her marriage and career, there were a number of things she could do over the course of a year to make herself just... that much happier. I already feel lighter while reading it. So many of us are content, "happy" and going about our merry business without realizing that we haven't even reached our full potential for fulfillment and well-being. 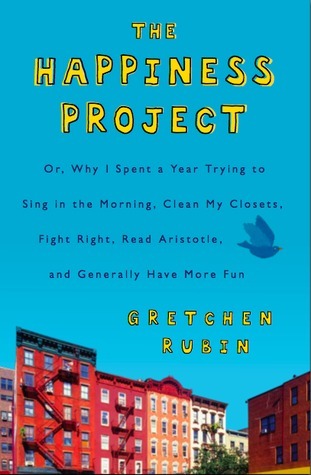 Reading Gretchen's own account is valuable and applies to any regular life, but it's the extensive philosophical, medical, theoretical and scientific evidence towards the case of "happiness" she provides that really sets the book apart from a regular literary experiment. Her efforts and research to prove that people (including herself) are not putting nearly enough effort into their own bliss and are coasting through life at a comfortable rate, really make you step back and assess your own possibilities in the realm of happiness and achieving your goals. Definitely going to pick this up!